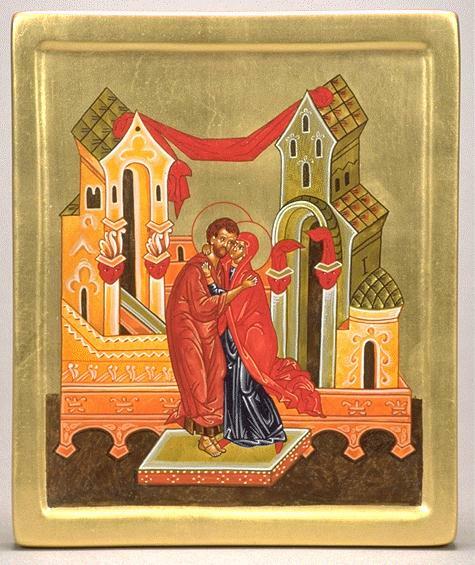 Today is the Memorial of Sts Joachim and Anne. We don’t know much about them, except they were the parents of Mary, and therefore the grandparents of Jesus. In order to bear the Son of God, Mary was made immaculate, without the stain of sin. I think it’s safe to say that Joachim and Anne must have been pretty special, too. Tradition has it that Anne was childless until old age. Thinking her child would be a son, she promised to dedicate him to the temple. Recognizing that Mary was a gift from God, she kept her promise, and Mary served in the temple from the age of three. 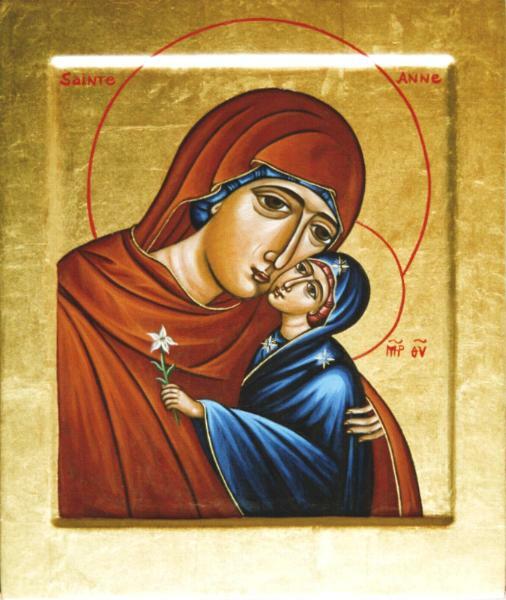 St. Anne is the beloved companion of women in many stages of life: she is the Patron of housewives, grandmothers, unmarried women, and women in labour. There is a well known prayer some of us use: St Anne, St Anne, find me a man! Most of us have the blessing of knowing the unceasing, unconditional love of a grandmother. 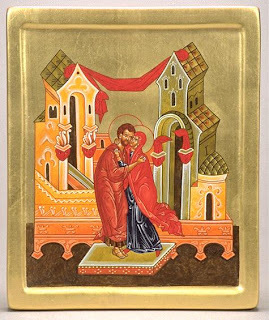 Through the generosity of God, our family extends to those in His presence in heaven, therefore we can then claim Sts Joachim and Anne as our grandparents, and turn to them for their intercession, guidance, and consolation. Good Saint Anne, you are the mother of Mary and the grandmother of Jesus. You open our eyes to the goodness of God our Father who sent his Son Jesus, God made man, to walk in our midst. Saint Anne, as you pray for us and with us, our trust in the Father grows. We now present our intentions to you and offer you all those in need. We pray that we may become WITNESSES OF THE LORD JESUS; witnesses of His love for each one of us and of His compassion for the entire world. Tess, I'm so glad you placed a picture of the shrine Ste.Anne de Beaupre in your post. I have been there about five times in the last several years and it is magnificent. It is truly a testament of faith of those that lived in Quebec at the time. Within those walls you are transported to a place that is a piece of heaven on Earth. The power of 'Grandma's' intercessory prayers is evident in the dozens upon dozens of crutches left behind by those healed because of her prayers. Walking into the basilica and strolling around the grounds of the shrine gave me such a sense of peace with the knowledge that indeed we are not alone in the struggles of life. I pray that Quebec, all of Canada and her southern neighbor, the USA, find their faith again. Europe may have some of the most beautiful churches in the world, but we who live on this continent do not have to travel so far. We have our own gem waiting for us in Beaupre, Quebec. Thanks for the post! I remember being truly awed the first time I saw the crutches covering the pillars of the basilica. The story of how the shrine came to be is very special as well. Further down the road we find a shrine to Anne's daughter - Notre Dame du Cap-de-la-Madeleine, another beautiful, peaceful spot. Holiness is seeped into the very ground there. 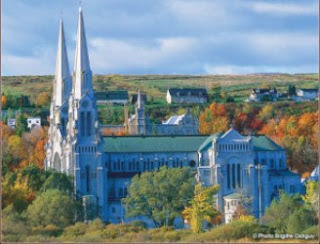 Traveling through Quebec or perusing its map is like making a litany of the saints, clear evidence that God used to be the centre of public and private life. I join you in praying for a restoration of faith, when we once again give all glory to God.